Batley Bulldogs are gearing up to face old rivals Dewsbury Rams for a fifth time this season knowing victory will secure a home semi-final in the Kingstone Press Championship Shield. Monday’s impressive performance away to Bradford Bulls — which saw Batley score 44 unanswered points in the space of 27 minutes either side of half-time — gave the Bulldogs a first win at Odsal since 1972 and puts Matt Diskin’s side on the brink of clinching second place in the Shield table. 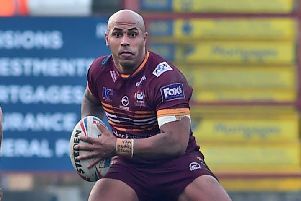 Batley produced some scintilating rugby in a 44-18 win, which boosts confidence ahead of the Rams visit. Diskin was impressed with his side’s display but believes there is still room for improvement against a Dewsbury side whose five match winning run was ended by a 35-28 defeat at home to Swinton on Monday. Diskin said: “I thought for the first 20 minutes and the last 20 we were scrappy, but in the middle 40 I thought we were really good. Dewsbury won the first three derbies this season but Batley won 36-20 at home in July and the sides could yet meet in the Shield semi-finals or final.